But rights groups say there is increasing official hostility towards Muslims in China. Many questioned why authorities did not stop construction of the mosque, which took two years to complete, if it had been granted relevant permits, according to the Hong Kong-based South China Morning Post newspaper. Protests were held outside the mosque on Thursday and continued into Friday, say the reports. 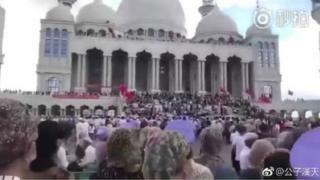 Pictures circulating on Chinese social media showed large crowds gathering outside the large white building, which has several soaring minarets and domes. In recent years, officials have become particularly wary of foreign religious influences, and authorities have targeted unofficial “house churches” connected to overseas missions. While Hui Muslims have largely been well-integrated and left free to practice their religion, Uighur Muslims in western Xinjiang province have faced growing government pressure. Rights groups say citizens in Xinjiang are facing increasingly intrusive methods of government surveillance and control, with many punished for “extremist” behaviour like wearing veils in public places, or refusing to watch public radio and TV programmes. Thousands of Uighurs are also believed to have been forcibly sent to “education camps”. According to Human Rights Watch, detainees are forced to renounce their ethnic and religious identities. But the current move to demolish the Ningxia mosque is indication that the government is now looking to extend control over other Muslim ethnic minorities, says rights groups Amnesty International.